Free of charge: for visitors under 18 years old. Meeting with the Guide by the entrance of Porta Marina Superiore. 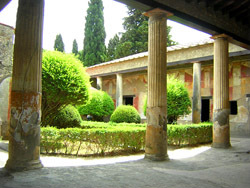 Enjoy a real journey in search of an ancient civilization destroyed by the terrible eruption of Vesuvius in 79 A.D. Pompeii is one of the most significant historic vestiges of the Roman civilization and it appears as an exceptional open book on the art, customs, and crafts, of the everyday life of the time. 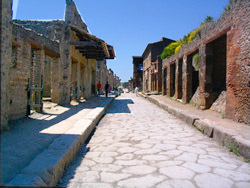 Today, Pompeii is one of Italy's leading tourist attractions and is a UNESCO World Heritage Site. 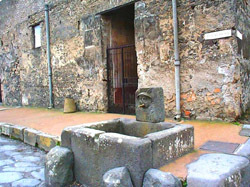 Visit the Pompeii ruins on foot for approximately two hours with a English-speaking local guide on an archaeological journey through the ancient city. Through the remains and ruins of this ancient city, you can imagine the everyday life of the Roman Empire and imagine the panic felt by the people in those last few minutes before the city was so disastrously buried. The volcano buried the city under many feet of ash and it was lost for 1,600 years before its accidental rediscovery. 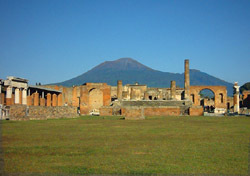 THIS TWO-HOUR EXCURSION IN POMPEII RUINS COSTS EURO 150. ENTRANCE FEE IS NOT INCLUDED.